In the Judeo-Christian story of Samson and Delilah, Samson is a mighty judge and Nazirite, whose supernatural strength lies in his locks. When he reveals the secret of his might to Delilah, she cuts his hair, and he loses his strength. 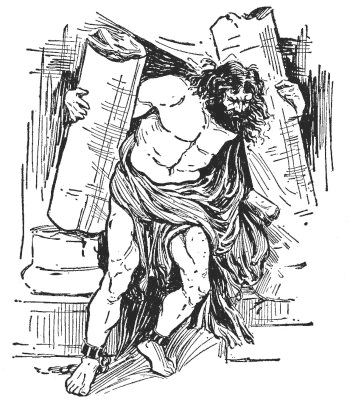 “But his hair, though cut off, began to grow again” (Judges 16:22); and when this happens, Samson regains his power. In his final act, he collapses a temple on top of himself and 3000 Philistines, by pushing down its pillars with his bare hand. Over the ages, through characters like Samson, Medusa, and Rapunzel, hair has served as a symbol of strength, power, and beauty in myths, legends and literature. Nowadays, we’d like to think of hair as being “just hair”, but these types of narratives, coupled with cultural practices, have given us certain notions about our tresses. As such, hair has become associated with our moods, emotions, and our very being—like an extension of the soul. In some cultures, this association goes even further than that: hair actually has a spiritual significance. For example, followers of Rastafari and Sikhism believe that hair itself is holy, so they allow their hair to grow and never cut it. Also, in many cultures, the styling or cutting of hair plays a role in ceremonial rituals and rites of passage. Since hair has been thought to be connected to a person’s being/soul/spirit, throughout history, various cultures have developed specific beliefs and superstitions about hair. For instance, in West African and Caribbean societies, there’s a belief that pieces of your hair could be used to hex you, so people try to make sure that their hair doesn’t get into the hands of the wrong person! In my family, although we’re not superstitious, we too have internalized the practice of carefully throwing away any hair that’s been left on the floor or stuck in our combs and brushes (it’s so funny how your culture affects your behaviour!) This idea of your hair embodying your being is also part of the reason why putting your hands in a Black person’s hair—without invitation—is a BIG no-no (more on that in future posts). Aside from beliefs and superstitions, I would also say that hair itself is kind of magical: it’s dead, yet it’s also alive at the same time. When you cut it, it grows right back. And it can also be changed and rearranged, and return to its original state, which allows you to change it again and again. When my sister and I were younger, our Mom would always say, “your hair is your glory”. Back then, I didn’t realize that what she was making a biblical reference; but in any case, like many other things, she was right: society ties hair to beauty. A full, thick head of long sleek straight hair, preferably blond, and no-greys, is the (unsaid?) prototype for the modern woman. Such hair is thought to represent youth, vigor, health, propriety, and sexiness. Furthermore, “beautiful” hair must also be “done”: it must be combed, brushed, trimmed, shiny, and neatly arranged. This is the beginning of a much larger discussion, as these are just some of the underlying notions that influence how we, as humans, view and understand hair. For further information on the significance of hair, see The Encyclopedia of Hair: A Cultural History by Victoria Sherrow, Greenwood Press, 2006. What are some of the beliefs that your culture has taught you about hair? So true, I can’t tell you the times people have implied directly or indirectly that I’m ” not taking care of my hair ” 😨 There are always options to improve my routine but I do “do my hair” and I have realized that people misunderstand my hair simply because they are comparing it to theirs or what they believe “done hair” looks like. I totally agree, you just have to “do you”! Thanks for sharing, Heather! You just have to hold your head up high, and keep it moving! People will also have something to say (or to imply), so we can’t even waste time studying them. Glad to hear that you’re comfortable with doing you- you’ve already won half the battle!